Black lipstick: is it OK for real life? Those of you that went through a goth period in your youth, look away now. Yes, it seems that the lipstick colour of choice for angst ridden 14 year olds with a penchant for Sisters of Mercy is making a catwalk comeback. Black is back, seen on all sorts of runways this season – most notably Luella, Nathan Jenden and Giles, as featured in this rather snazzy collage I whipped up. Is black lipstick do-able in real life? And where does one get hold of it, Hot Topic aside? Keep reading to find out! Black is a pretty tricky colour to carry off – prepare for HILARIOUS goth comments a-go-go. The three looks in my montage of joy are all slightly different takes on the dark lip – Luella is classic goth-girl, added to by the extensions, faux-dreads, and crimping. Nathan Jenden is out and out geisha girl, with the blue and red face blush and white face powder, whilst Giles is pure theatrical drama. You might be surprised to hear that black lipstick is nigh on impossible to find. I didn’t exactly expect to see it everywhere, but it has been a real struggle to even find any. Whilst fancy dress shops and those shops that sell band patches and studded wristbands (oh come on, every town has one) flog black lipstick by the bucketload, it isn’t exactly good quality, and will probably make you look like a knob. At least with a more reputable brand, you’re in with a chance of getting it right. It’s like the subtle differences between red lipstick which makes you look like a 50s starlet or a strumpet. The answer might be to blend your own colour – it’s what most make-up artists do, and isn’t too hard. A little black facepaint or cream eyeshadow, mixed on the back of your hand with a dark red or purple lipstick. Still, it’s not all bad news. I managed to find 3 pretty good goth-approved lipsticks, thanks to the good folk at Gothic.net. I’m sure when the A/W shows are over, and the looks start filtering through to the High Street, there’ll be more options available. Perhaps surprisingly, MAC don’t have a black lipstick available. Considering they do a lot of make-up for the shows, I wouldn’t be surprised if one showed up soon. For now, your best bet is Cyber (a very dark purple) or Diva (a dark burgundy red). Good old Barry M, on the other hand, have a great black (called, imaginatively, Black) and a whole range of really great purples. It always surprises me that Barry M isn’t more famous – their colours are amazing, and really cheap. Also great quality, so it’s not just like some crappy bargain line. Finally, Stargazer (ah, takes me back!) 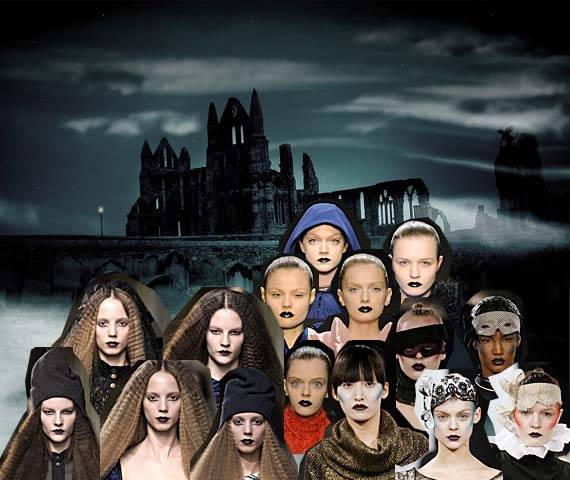 have a whole section on their site called ‘Goth Girl’, which gives you a good idea of the look this store go for. The Fantasy lipstick range features a glittery black (way better than it sounds, honest), whilst numbers 110, 130 and 133 are all great matte colours. Photo credit: Matt West on Flickr!